We consider it a privilege to nurture and watch our students grow, mature, and give back to their communities with their talents and their gifts. We are committed to guiding our students to learn Eternal Principles and choose daily to make Intelligent Choices. Will you consider giving to one of our great needs, and help us continue to minister to our students? Thank you for your faithful support! Your gift to LLA makes a difference for generations of students to come. WHAT IS THE LLA IMPACT FUND? STEM Maker Cart for TK-6th grade and Maker Space Equipment for the 7th & 8th grade: What is STEM? Science, Technology, Engineering and Mathematics. STEM learning gives students the opportunity to develop their creative, problem-solving skills through hands-on learning. 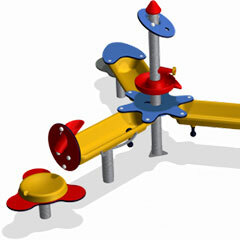 This equipment would provide toys, tools, and materials to build, create and learn! Band Lockers for 5th-12th grades: Our current lockers are dated and many are unusable – not even sized appropriately for all instruments! Many of our instruments are stored on the floor until we can meet this need. Obtaining new, instrument-specific lockers would enable to us to have an orderly, safe and aesthetically pleasing way to store our instruments. The Children's Center needs to replace the aging water play feature in the playground. The new water feature is designed to engage children as a table of exploration, the basins and three satellite play counters will provide multiple access points for play. Faculty support enables us to fund two vital areas for our teachers: classroom funds and professional development. * Classroom funds allow teachers to purchase additional resources for their classrooms and students such as interactive materials, books, craft supplies, and more! Faculty support also provides professional development opportunities for our faculty to that they keep abreast of the latest curricula and methodologies relevant to their areas of expertise. *Currently, the Southeastern California Conference is providing dollar-for-dollar matching for our faculty professional development endowed fund. Take advantage of this opportunity and double the impact of your gift today! Absolutely. The security and confidentiality of your information is our highest priority. We use industry-standard technology to protect your information and provide a safe and secure environment for online donations. We will not sell, trade, or share your personal information with anyone else, nor send donor mailings on behalf of other organizations. A donation receipt will be sent to you at the e-mail address you provide on this form. Please be sure to keep a copy of your receipt for tax purposes. If you select a recurring donation, you will be sent an individual receipt each month when your donation is processed. Yes. We are a 501(c)3 tax-exempt organization and your donation is tax-deductible within the guidelines of U.S. law. Our Tax ID number is : 95-1831069. To claim a donation as a deduction on your taxes, please keep your donation receipt as your official record. 100% of your donation is going toward the fund you designate. We do not take a portion of your gift to cover other fees. Yes, we will respect your request to be anonymous. You will still receive a tax-deductible receipt, but your name will not be published anywhere. Call 909-796-0161 ext. 3316 if you would prefer to be an anonymous donor. We respect the privacy of our donors and will not publish any donor names without speaking to the donor prior. CAN I DONATE FOR A SPECIFIC STUDENT’S TUITION, MUSIC TOUR, OR OTHER FEES? You can donate to the Student Aid fund which is awarded to families who apply for financial assistance. You can also donate to specific programs such as Wind Symphony or Elementary Art. However, if paying for a specific student’s tuition of fees, we cannot issue a tax-deductible receipt for you. That payment needs to be handled through the Business Office (909-796-0161 ext. 3351) because it is considered a payment. As each Enrichment category is funded, excess funds will be applied to the other categories.